Facebook starts a new strategy, to switch people from SMS to Messenger. It allows the Android users to send or receive text messages, just inside from their Facebook messenger app. By globally roll out of this innovative SMS feature, Facebook, tries to bring ease towards its users, as now you do not have to jump out between different chat interfaces. Facebook product Manager “Andrea Vaccari,” said that “there is another SMS client there already in the market. Some are quite popular because of their feature” as their pinpoint is customization. She also said that apps like GO SMS, and QK SMS, it allows to send Emojis, Gifs, and you can also set special color themes, and much more, but we can provide these feature in more effective and easy way. 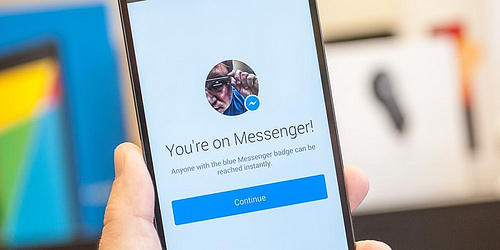 In 2012 Facebook first introduced the SMS messenger feature, for Android devices, that shows text in both default messages app and as well on Messenger app but soon dropped it after in 2013, due to minimal grip or features compatibility lags in the app. However, in 2016, Facebook, launched the SMS feature again after testing the modern version of Facebook Messenger app. Starting today, the Android users throughout the world can now use Facebook messenger as an SMS app as well. To set up this feature, you just have to update you messenger app too, latest Android app version, and then go to the settings tab in Facebook Messenger and set SMS>Default SMS app. After doing so, all of your SMS threads will appear in purple color, space with your blue color Facebook chats. As selecting Facebook messenger a default SMS app, you can still receive and read SMS by using the applications other than that of Facebook messenger, such as Android default SMS app, or as you download third party SMS software’s like GO SMS and many more of this kind, but you will only be able to send from SMS, and a standard SMS sending Fee must be charged by your carrier. On the other hand, users can receive the SMS without any difficulty as SMS sent from the messenger, and they note to be able to differentiate, either the message they received is sent from Standard Android SMS app, or by Facebook messenger. As this flexibility in Android, but iOS does not provide much flexibility to developers, iOS does not allow to change your SMS client, and there no plans to bring that feature iOS user. You will be able to send to send Facebook stickers, images as well as videos, as once you connected SMS to the messenger. SMS will be appeared and answered in the Chat Heads. By Facebook Messenger, you will only be able to send money, gifs, VoIP Voice and Video calls. Facebook impatiently assures that SMS messages in messenger, do not upload, send or stored to Facebook servers. A standard fee is charged by your carrier for sending SMS by messenger, but Facebook messages are sent over internet data.